The lace from the bodice extends slightly onto the crepe skirt, complemented with curved seaming that effortlessly shows off your shape. 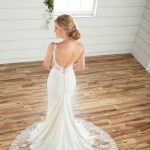 A low V-back highlights the back of this gown, with illusion tulle and lace on either side to create a true floating effect. A dramatic laser-cut train with a sheer, scalloped-lace trim. Flattering silhouette and dramatic train.